If you’re someone who loves wearing quirky tees and can live your life wearing one quirky one-liners on your tee after another, you’d probably want to bookmark this list. From graphic tees to ones with funny slogans, we’ve got a bunch of places doing them brilliantly because, hey, you can never have enough t-shirts, right? 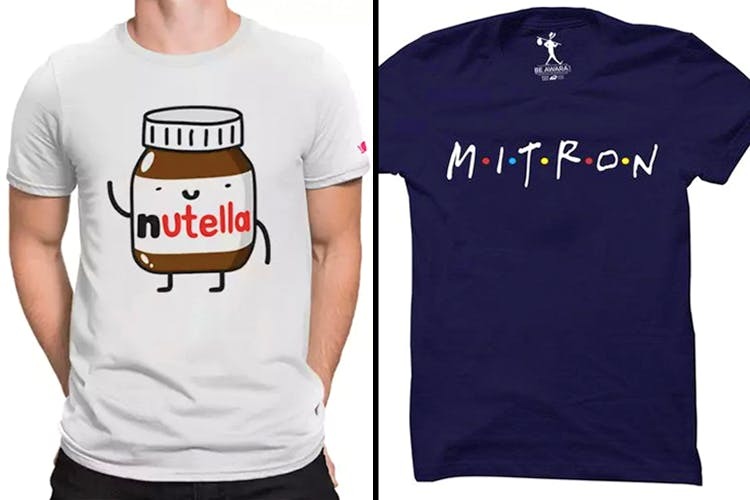 Bewakoof has always had our back for fun, affordable T-shirts. You can pick up a bunch of them for the whole gang with your favourite superheroes, or with some motivational lines to make you hit the gym. Whether its pizza slices making a peace sign, or Joey declaring he doesn’t share food, they have so many options to pick from. PS: If you’re a F.R.I.E.N.D.S. junkie, this place is your Mecca. They’re one of the best in the biz, they have the more options than most graphic tee hubs you’ll encounter, and we absolutely love their stuff. They even have their stuff sorted into neat collections, like food, travel, sports, pets, couples, fitness and more to make it easier for you to choose your favourites. They have so many different kinds of shirts to pick from – skeletons dabbing, sassy one-liners, superheroes, stills from our favourite TV shows and more – they’re doing it all. They have the nicest graphic tees, but what we’re loving the most are their vintage poster-like printed t-shirt. Whether it’s a hawaldar on your shirt or a funny one of Hitler with some bright lipstick on, their shirts are killing it. They make for great gifts too. If you’re in the market for more than just a tee, their quirky boxers are worth a gander as well. They’re doing TV-show and movie inspired t-shirts, and tees with tons of pop culture biggies on ’em. Whether you’re a die-hard Avengers fan or you love your cartoons – or even need some fun, girl-power inspired shirts for your gang, their collection is great. You can even send in a print or design of your choice to be put on a T-shirt. They have catchy slogans, funny one-liners, superhero shirts and more. Their slogan t-shirts are so funny, and tend to be the best when they have a cult hindi phrase emblazoned on them. They even have matching tees for couples and friends. Whether you want a ‘Straight Outta Gotham’ tee or ‘Aria’s To-Kill List’ one, these guys are doing some really fun shirts. We love all the GOT, South Park, Spongebob Squarepants and Rick & Morty inspired ones.